The 2011 National Survey of Fishing, Hunting and Wildlife-Associated Recreation indicated that 71.8 million people over the age of 16 participated in some form of wildlife observation. In doing so, they spent more than $54.9 billion on trips, equipment and other related items. Among these were more than 25.4 million photographers, outranking hunters by nearly two to one. Clearly, photography, specifically wildlife photography, is a rapidly growing outdoor pastime. Our growing demand for a connection with nature and increased interest in photography aided by the availability of affordable digital cameras has increased the number of photographers. It is important to point out that while photographers outrank hunters by two to one, it is hunters and the dollars they spend on wildlife conservation that often aid photographers in their quest for quality wildlife images. While I am an avid hunter as well as a professional photographer, there are photographers who do not hunt. A few of these photographers are anti-hunters but the vast majority—even if they don’t hunt—recognize the contributions that hunters make to wildlife conservation. By providing and improving habitat, hunters help to increase wildlife populations and their distribution, allowing photographers to more easily and more frequently access wildlife to photograph. An example of the contributions hunters make to wildlife photography is evident on many federal National Wildlife Refuges and state wildlife areas. For 26 years, I was biologist and refuge manager with the U.S. Fish and Wildlife Service (USFWS), the governmental agency responsible for management of the National Wildlife Refuge System. On numerous occasions, organizations including Ducks Unlimited (DU) and the California Waterfowl Association (CWA), provided cost-sharing funds for habitat improvement projects in areas that were hunted as well as for closed areas set aside for wildlife observation. Many of these habitat projects were directed at enhancing wetland areas for waterfowl but they also benefitted endangered as well as non-game species—a fact that many people overlook. These organizations provided dollars or in-kind services such as engineering and contract administration that increased the scope of the habitat improvement or development project. In many cases, this cost sharing doubled the acres of habitat that were positively impacted compared to a project that was funded solely by the USFWS. In step with wildlife conservation groups nationwide, both DU and the CWA are conservation organizations whose memberships are primarily comprised of hunters. I recently returned from a photo trip following the spring migration of waterfowl from Nebraska through South Dakota and North Dakota and eventually into Manitoba, Canada. My goal was to photograph ducks and geese during their spring migration north. Spring is when waterfowl plumage is at its best and, as the breeding season approaches, ducks in particular focus on finding a mate. 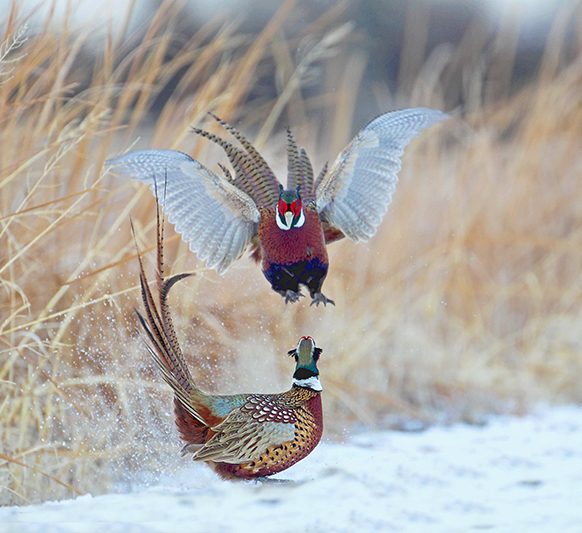 Courtship activity rises to a fever pitch, providing an interesting array of behaviors to photograph. Throughout my travels, I looked for waterfowl concentrations. Sure, some were on private land but the majority of the significant concentrations, all the way from Nebraska to Canada, were found on federal National Wildlife Refuges (NWRs), Waterfowl Production Areas (WPAs), state wildlife areas and DU and Delta Waterfowl projects where habitat was provided and managed specifically for migrating waterfowl. Most of the NWRs and all of the WPAs were purchased with money derived from the sale of Migratory Bird Hunting and Conservation Stamps, or as most people know them—Duck Stamps. These $25 stamps are required of every individual who hunts waterfowl in United States. Canada also has a Migratory Bird Stamp ($17) program and many individual states also have State Duck Stamps. The dollars collected are used to purchase habitat for waterfowl and other wildlife. Of course, DU and Delta Waterfowl projects are funded primarily by hunters’ donations. These are just a few examples of where hunters and the dollars they provide are instrumental in providing and maintaining wildlife habitat. In addition to benefiting wildlife, such habitat benefits photographers, people interested in wildlife, outdoor enthusiasts and the general public. As a wildlife photographer who makes his living spending countless hours on wild lands, I take my hat off to hunters who are largely responsible for the existence and quality of the wild lands where I photograph. And above all, it is the NRA that protects our ability to own and use firearms—a vital element of our hunting heritage. Editor's Note: Nationally recognized outdoor writer and photographer Gary Kramer of Willows, Calif., is a frequent contributor to hunting and conservation publications, including NRA’s American Hunter, Ducks Unlimited, Delta Waterfowl and Pheasants Forever, with multiple books to his credit. 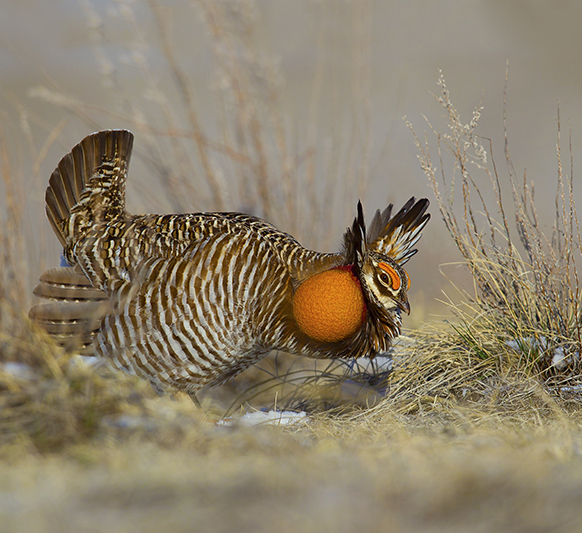 His latest title, “Game Birds—A Celebration of North American Upland Birds,” is a 256-page coffee-table book showcasing 384 color photos. It is the most comprehensive book ever written on all 34 game birds found in the United States and Canada. The cost of the book is $65, including shipping and postage anywhere in the United States. To order your copy, visit www.GaryKramer.net or call 530-934-3873.